Elijah dumped dirt on my bedroom floor. While I was cleaning that up, he spilled salt all over my dining room floor. 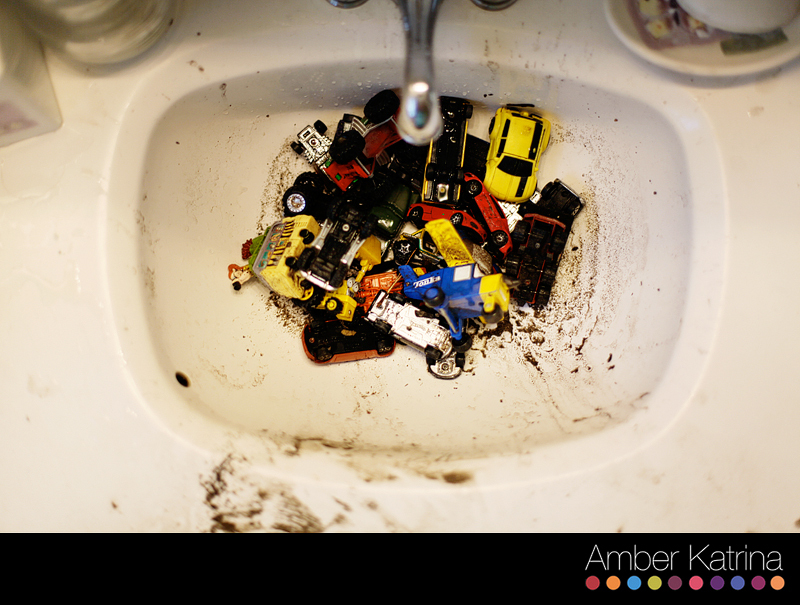 While I was cleaning that up, he dumped his very dirty cars into the bathroom sink, making a big muddy mess. I decided to give up and just take pictures. Eli loooooves his cars. Each morning, he grabs his basket of cars and takes them to his road blanket and lines them all up as if they are all in LA rush hour traffic and then he parks them all side by side, as if they were in a hellish mall parking lot during the holidays. Then he repeats it all over again (hmmmm, I think he may be imitating daddy’s endless commute to work). He takes good care of them too. 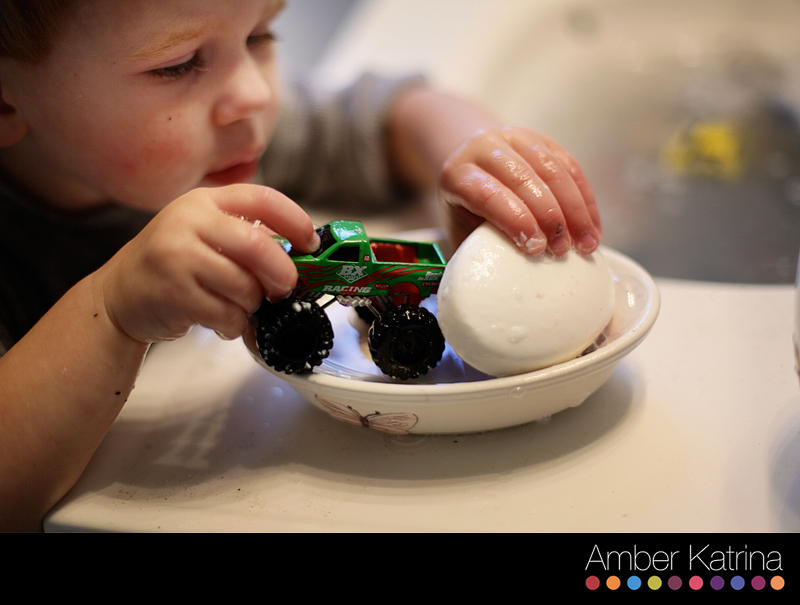 If he gets them all dirty in the sandbox (which is really just a dirt-pile, but it makes me feel better to call it a sandbox), then he wants to wash them off in a “car wash”. He definitely doesn’t get this from us. I don’t think I’ve washed my car since I don’t know when: before the baby was born? or before I was even pregnant? sad. As we were cleaning up Eli’s cars, baby Levi decided to make a HUGE blowout diaper. The kind that involves throwing away clothes and taking him straight to a bath. So I gave Elijah a towel and told him to dry his cars off. Note to self: give toddler more instruction about taking them OUT of the water first. Yeah – this is pretty much my life as a mom. When I was pregnant, my friend at work told me that she dropped her son in the hospital. One minute she was groggily holding the baby to her breast, trying to feed him, and the next thing she knew the baby was screaming on the linoleum floor and nurses were rushing into the room. ‘That’s awful!’ I thought. ‘I would never let my baby fall.’ Yeah, I’ll admit it – I was a bit smug. Check out this song: Pregnant Women are Smug by Garfunkel and Oates. But that was before I had kids. The night we brought my oldest son home from the hospital, I was trying to feed him in the middle-of-the-night delirium that is new motherhood. Well, you can guess. He rolled off the couch onto the floor. Yep – I was THAT mom. And it only took a few days to get there. There’s nothing like kids to make you humble. With my second child, I have realized that no matter my shortcomings as an ignorant new mother, the oldest child has it easy. No mother goes around hitting their baby on the head with a rattle. But a big brother does. Hard enough to leave a lump. Poor baby. I think we moms are so judgmental of each other and we shouldn’t be. Because no matter how smug you are that your baby sleeps, eats or poops, the minute you brag to yourself – everything changes. 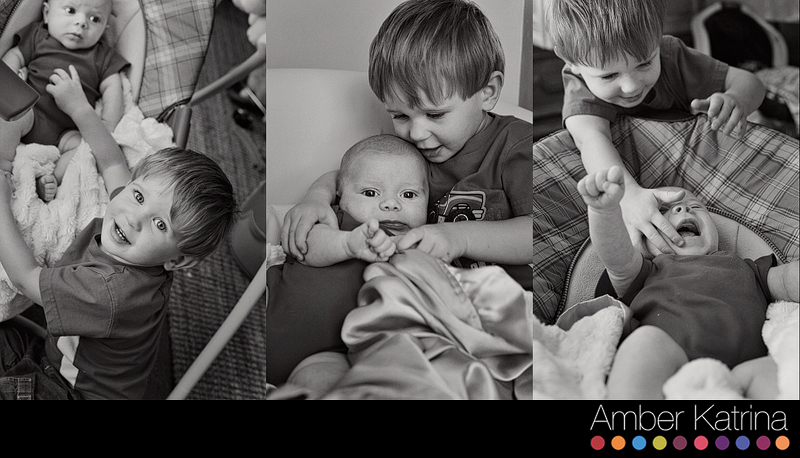 I have been toying with the idea to incorporate my personal life in my photography blog. But who would want to know more about me? I don’t know. But I do know that blogs with just streams of pictures are boring. I started thinking about what all my favorite photographers have in common (other than AMAZING images of course), and I realized they all share bits and pieces of who they are, what they like/dislike, insights into how they work, tips for other photographers, etc. In short – more than just their photographs. That’s what my website is for, right? By not being “real”, I realized that I’m not even doing what I expect of my clients. 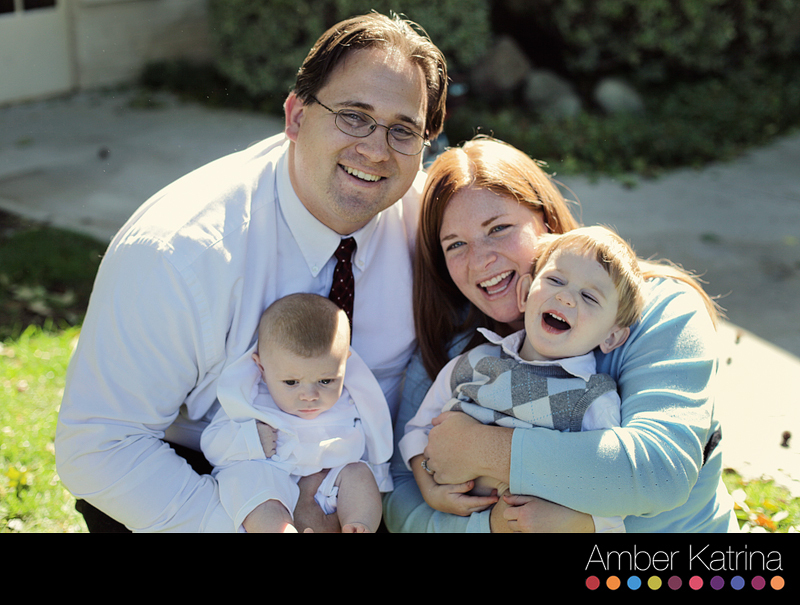 I ask my clients to be “real” in front of the camera, to show their true selves, let loose and have fun. But I’m not even doing that on my blog. So in an effort to practice what I preach, I vow to let go of my perfectionism and make time to create a blog and website I would like to put in my RSS feed or follow on Facebook. And since a post is not complete without a picture, here is our family at Levi’s blessing two weeks ago.